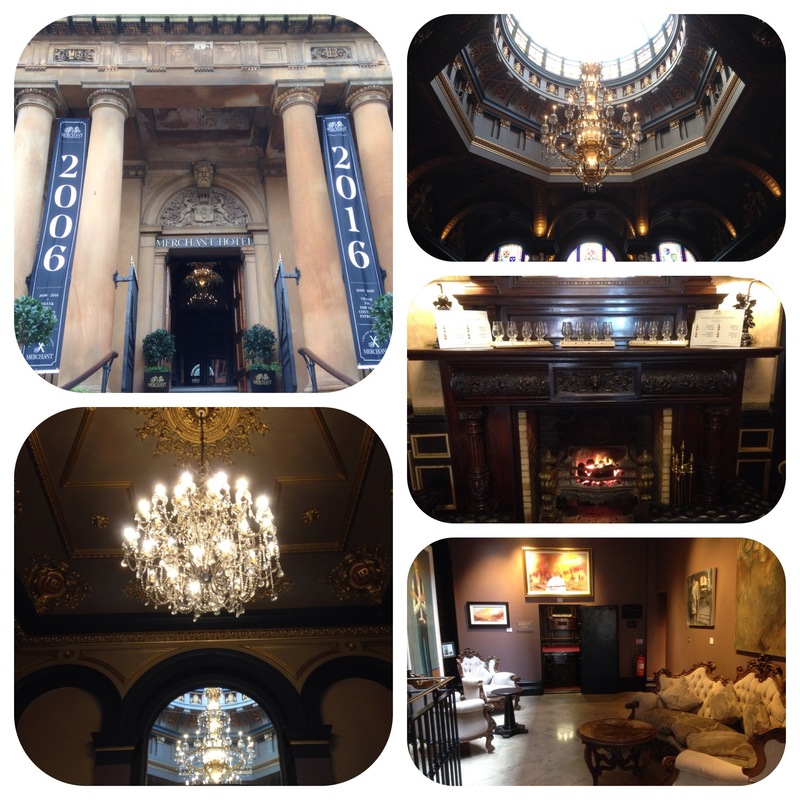 Cheese SymposiumThe Merchant Hotel in Belfast was the setting for the 2016 Cheese Symposium. 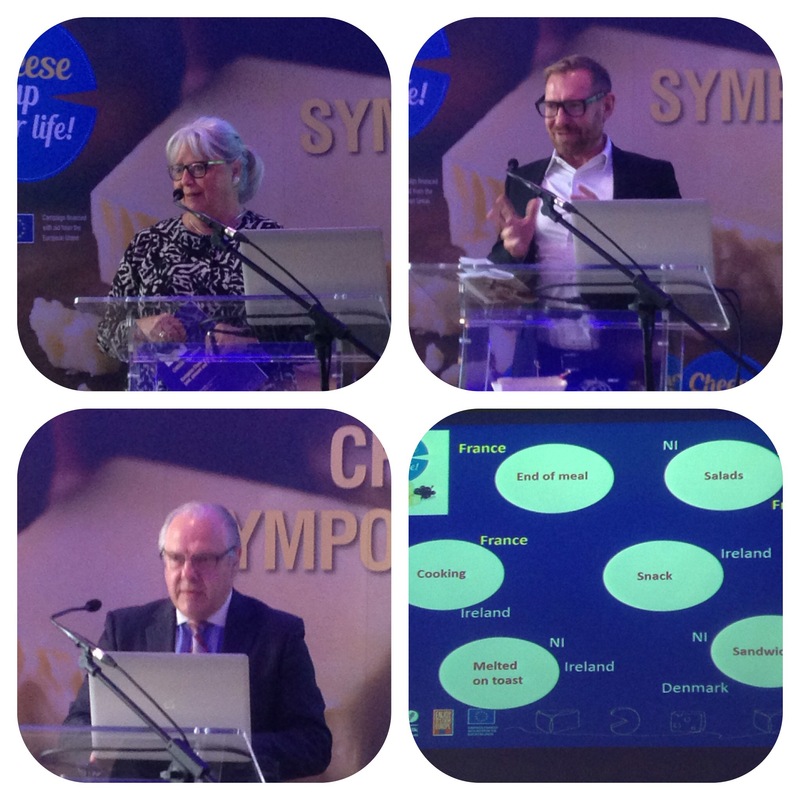 The Title of the symposium was “European Cheese Culture: past, present and future”. The morning was chaired by the esteemed food writer and cook, Trish Deseine. I love my cheese and wondered just what nuggets of information I could find. I was totally blown away. Lets start. On arrival there was tea, coffee, juice and water to accompany cheddar and onion cheese muffins, Danbo on rye bread and pickled fennel, Comte and pancetta frittata and Bircher muesli pots. I tried the first three (the frittata was my favourite-small cheesy/ham omelettes, then the Danbo on rye followed by the muffin). Trish welcomed us all and introduced the first speaker Dr Jessica Smyth. 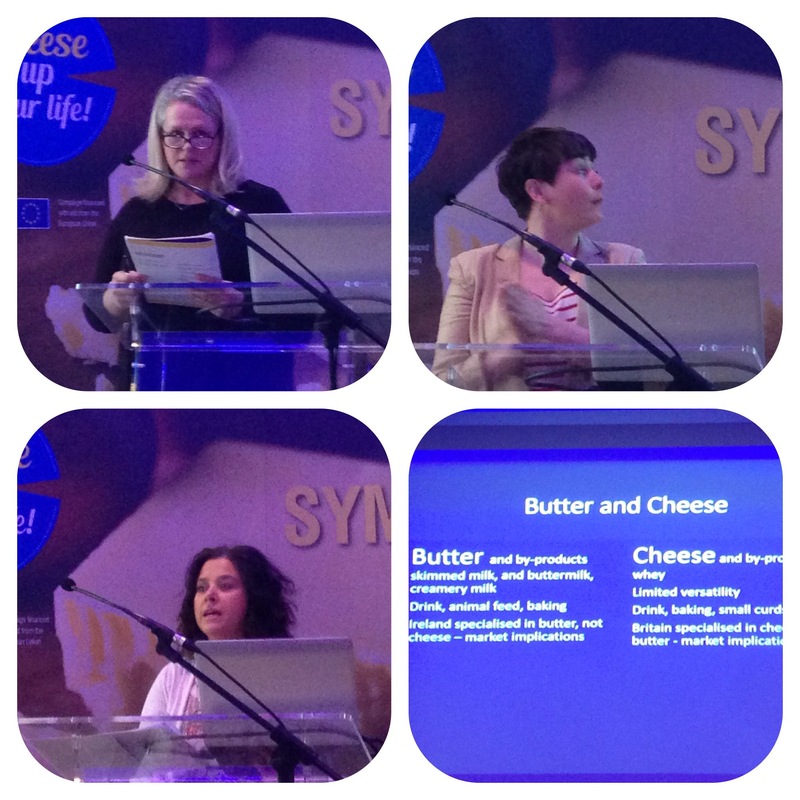 Dr Smyth spoke about the prehistoric origins of dairying and cheese making in Ireland and Europe. She talked about how people became lactose intolerant. This is a condition where some humans cannot digest the milk sugar lactose as they are missing the enzyme lactase (1/3 of world population have this enzyme). People who can digest lactose beyond infancy are called lactose persistent and this was caused by a genetic mutation dating back to circa 8000 years ago. The movement of cattle started from the Fertile Crescent circa 8000 years ago, spreading to Central Europe (circa 5-6000 years) and the UK and Ireland about 4000 years ago. The genetic mutation was possibly due to the high consumption of milk by humans. Incidentally when you heat milk the lactose content reduces, so in cheese there is little lactose. Regina Sexton then went on to talk about cheese in the island of Ireland from Medieval times, through the 17/18 th century high point of cheese making and its modern day revival. The progression of milk and its products in Ireland was milk then butter and lastly cheese. It was always easier to use the milk and then make butter, cheese really was an afterthought, due to its long manufacture and maturing time and secondly the by product of whey was not readily useable. In contrast butter was easier to make and the by products were easily used ie butter milk used in soda bread making. Interestingly the Cattle Acts of 1663 and 1666 stopped livestock from being exported from Ireland to mainland UK so the local farmers had to change their produce to butter and salted beef. England was always more cheese producing heavy and butter light so there was a natural market for Irish butter. The real boom period for Irish butter was between 1770-1924 with the setting up of the Cork Butter Market Exchange. More people started using cheese in recipes especially in stately homes like Townley Hall in County Louth. Fast forward to now the fact that the US market opened up in the 1960-70 really boosted the cheese industry here. It is going from strength to strength. 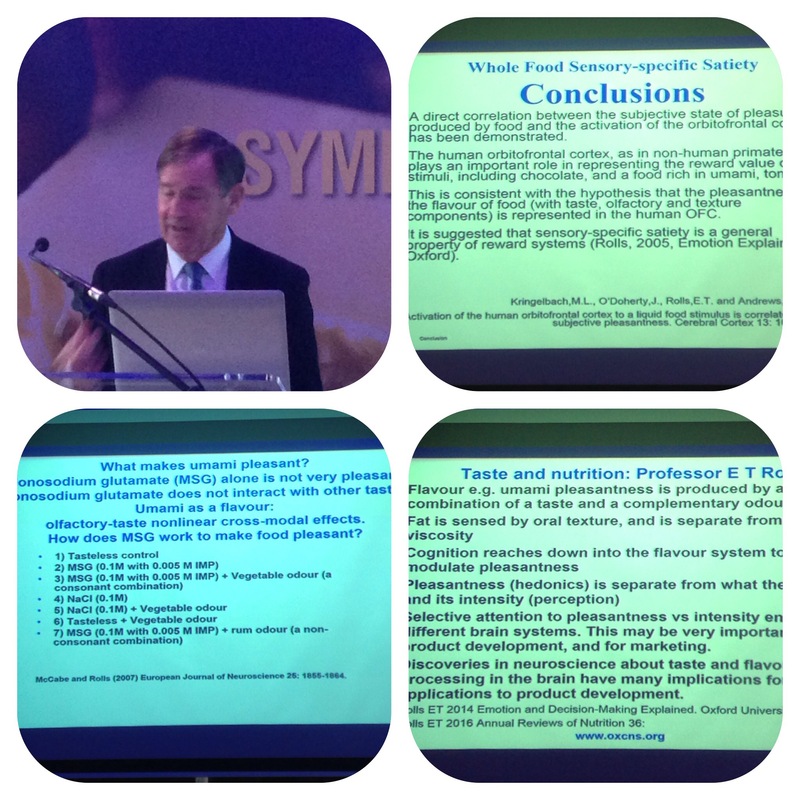 My favourite part of the Symposium was the superb talk by Professor Edmund Rolls from Oxford and Warwick Universities. He talked about the science of taste. What a talk…..very scientific based and great explanation of how our taste buds and sensory systems can distinguish things like taste, smell, sight, texture and descriptions and how they marry them up to give us our perceptions.He talked about Sensory Specific Satiety and how the Orbito Frontal Cortex is so important. Also he demonstrated how our taste buds can discern types of fats, viscosity of foods/fats (using Carboxy Methyl Cellulose which is a food thickener). The big reason for people who either love or hate cheese is Umami which is the fifth taste and is Japanese for delicious or pleasant savoury taste. This is all due to the glutamates in foods in particular monosodium glutamate. Cheese has very high levels of MSG as does mushrooms and meat and marmite!!! So you can either love it or hate it? There was then a talk from the super taster Lisbeth Ankersen from Denmark. A super taster is someone who has well above average taste buds in the tongue/mouth. Lisbeth talked about cheese pairings and talked about how to tell what types of “notes” one can taste and smell and how to describe them. She explained how to describe cheeses saying you look, smell, feel, taste and after taste. She went into the science behind this talking about flavour wheels, colour guides and very interestingly saying that 80% of our tastes occur in our nasal cavities!!! Then we had three esteemed speakers from Denmark, France and NI. 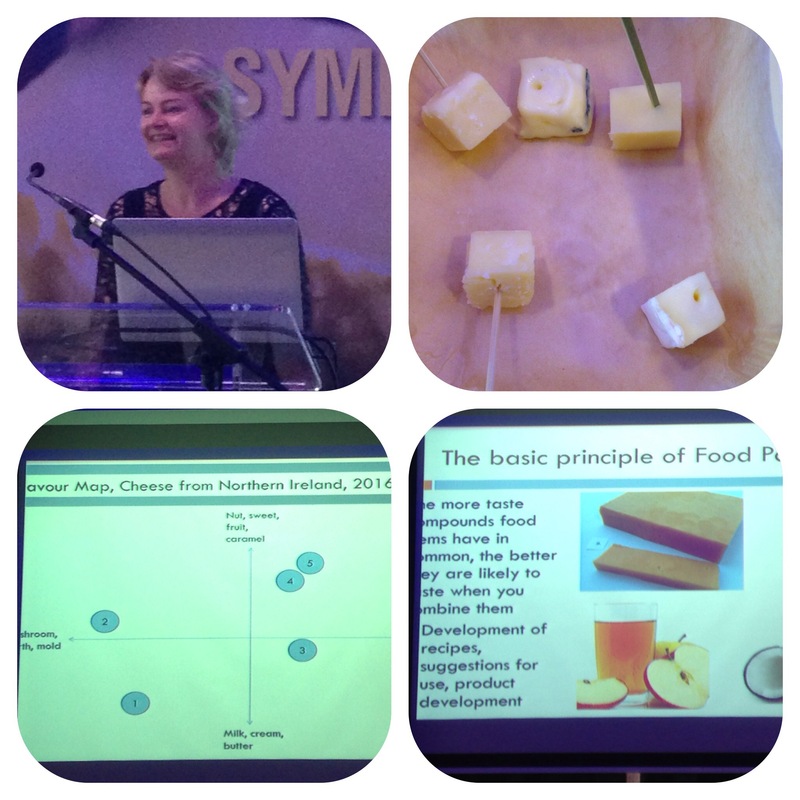 Winnie Pauli from Denmark told us that Danes love their cheese eg Danbo in the morning time at breakfast. Laurent Damiens from France told us that there are 1200 cheese varieties in France and that the French mainly eat their cheese between main course and dessert and that there is a new trend of eating cheese as an aperitif (from 2012). The emphasis here is quality, origin and presentation. Dr Mike Johnston MBE came in to bat for NI and he had a great knock. He was explaining we in Northern Ireland love our cheddar cheese the most, at lunch, in sandwiches and melted on toast is our favourite. Of note was the fact that young people like mild cheddar more and that older folk like the mature and vintage varieties…….my two daughters would beg to differ-they (7 and 4 years old) absolutely love Vintage, whilst my wife loves mild!! All the panellists then had an open discussion and fielded questions from the audience. Then followed a fantastic lunch spread of cheese on toast (sourdough, brie, leeks and fenugreek), croque madame (soft blue cheese, pickled beetroot with a fries egg on top), arancinin (mozzarella and mushroom) and macaron (sweet with savoury cheddar and bacon). For sweet there was Danablue with hazelnuts and maple syrup (in a pipette) and Cream cheese caramel doughnuts. 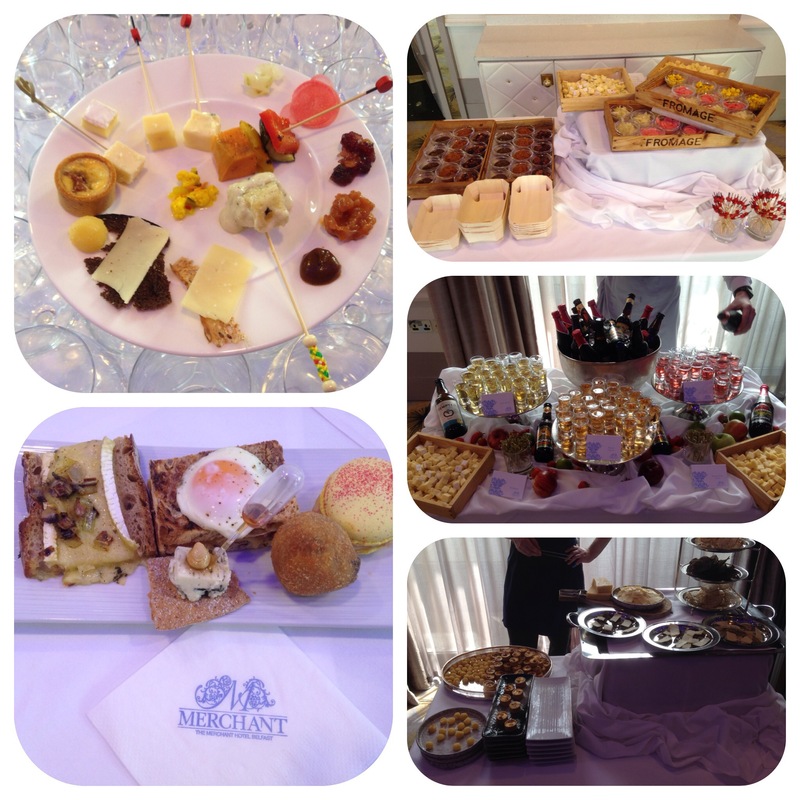 There were also live interactive cooking stations serving fondue, cheese canapés, cheese, pickles, preserves and chutneys and cheese and cider. There was also wine and soft drinks to wash it all down with. 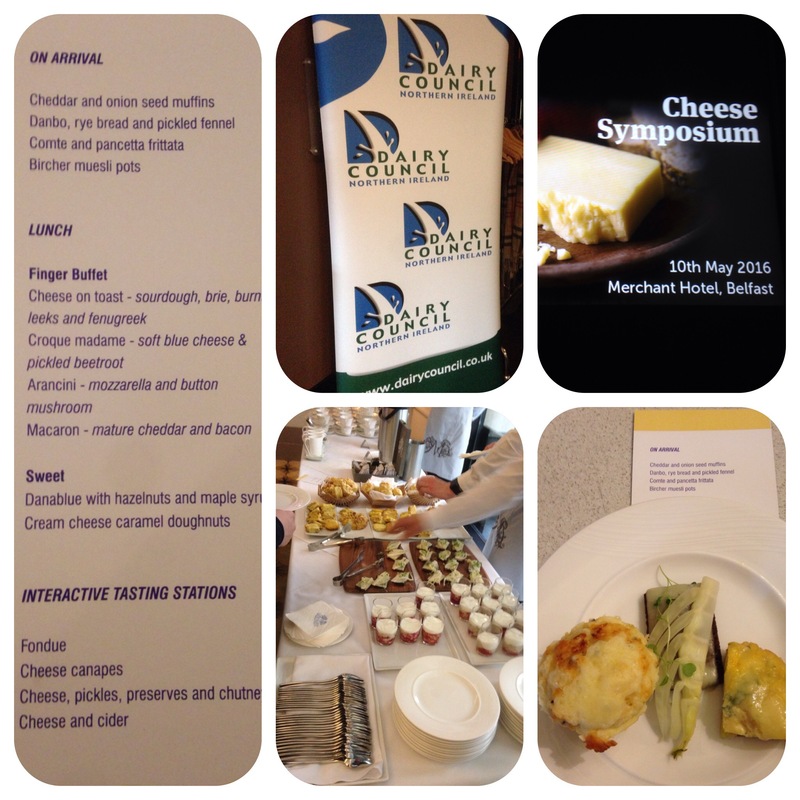 The symposium was a roaring success and has definitely educated me in many ways on the history of cheese. Our kids still do not eat a lot of cheese in NI so I would love to see cheese workshops or roadshows going into local schools to educate our kids and their parents. The “plastic” type cheeses like strings and slices are really not the real deal here.